About — Woodinville Toddler Group | Play. Learn. Explore. 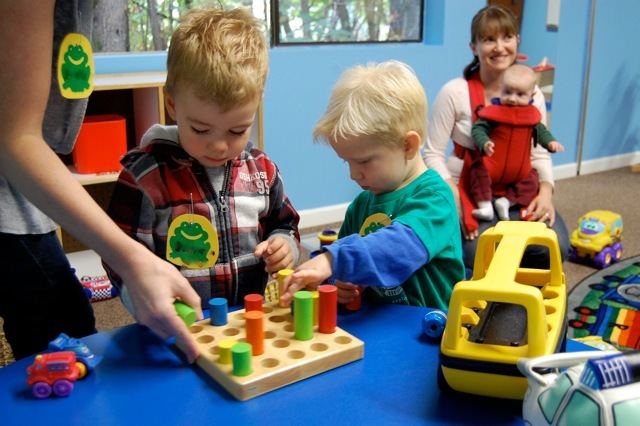 Woodinville Toddler Group is based on the philosophy that children learn best through play! We offer activities to use all senses, to problem-solve and learn through exploration. Our program reinforces cognitive skills through the activities provided in our enriched environment (games to promote language and color recognition, counting when building with blocks, making predictions with science experiments, creativity in use of materials). Our weekly circle time offers structure to promote listening and self-regulation skills, and includes additional cognitive skill development through rhythm and repetition. Woodinville Toddler Group is a place where parents and their infants or toddlers can create, learn, and explore...together! As a cooperative parenting education program, our goal is to build a community of support between parents and to provide an enriched environment where toddlers can engage in play and creativity with their peers. Our in-class parenting discussions and additional outside parenting education events provide you with support and knowledge for your journey as a parent. Numerous family events bring parents and children together to celebrate connection and community. At Woodinville Toddler Group, we look forward to exploring the wonderful world of infant toddlerhood with you and your family! Woodinville Toddler Group (WTG) is a non-profit parenting education cooperative program affiliated with Lake Washington Institute of Technology, serving Eastside families since 1989. Parents who join become students of Lake Washington Institute of Technology and will receive college credit. Building a sense of community is integral to Woodinville Toddler Group. We provide opportunities to participate in many other activities outside of our regular classes and parent education events. Some of these additional activities are Family Fun Night, Preschool Information Night, the Celebrate Woodinville Parade, Programs for Special Guests and the All-School Picnic. Woodinville Toddler Group instructors facilitate parent education, develop the children's curriculum, provide support to families, and offer overall leadership to the program. However, you are the real teachers of your child, and we are here to assist you on your journey. Woodinville Toddler Group provides the two of you an opportunity to play, to explore and to get to know other families in our area. As a student with LWIT, you are entitled to a student ID card which earns many student discounts!